Since Christmas is only 33 sleeps away, I thought i'd share some of the Christmas tips from the enrichment evening I went to. 1. Prepare: Plan your schedule and calendar now. Claim ownership to your time and learn to say no. Set your budget and don't exceed it. Plan your menu, time and activities wisely. I've drawn up a calendar and on it i've put all the activities i'll be going to, what i'll be cooking and when to start cooking, when to make certain crafts etc to help me prepare. It's helping a lot! 2. Service and Love: "How can I make someone else feel the true Spirit of Christmas this year?" Forget yourself and go to work. *Take a hamper filled with Christmas fare to a family that can't afford it for themselves. I remember doing this as a youth, we sang carols and gave hampers. It was a good experience. 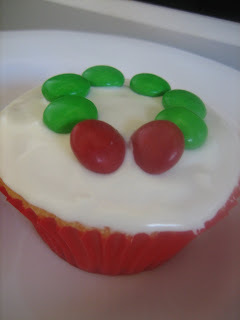 * Invite family, friends, neighbours into your home to watch the DVD "Joy to the World"
Ice cupcakes and put six green and two red m&m's ('m' side down) in a circle in the middle of the cupcakes putting the red m&m's slightly on an angle. Too easy huh! 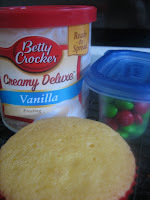 I put my cupcakes in red patty cases for a more festive look. 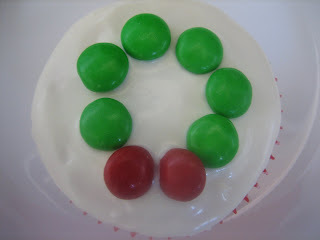 a little icing ribbon and these would look really cute... easy and cute.. I like EASY! !